Wolftown seem to be repping for the city of Houston hard! 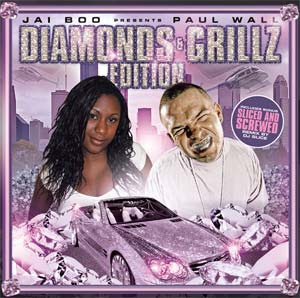 To date they have released official mixtapes with the likes of Chamillionaire, Trae, Ricky Lee, K-Rino and KB Da Kidnappa, and now it’s the turn of Swisha House artist, the man with the diamond smile Paul Wall! Jai Boo has been making serious moves this last year with her mixtape series getting respect from both sides of the Atlantic, but this double-disc package is just something else. Jai Boo deals with the regular speed mix while DJ Slice (Mike Jones’s DJ) slows it down for the ‘slowed and sliced’ CD. Loving a lot of tracks of this CD, like the head-butting banger by Jai Boo & LATE called ‘Diamond & Grills’ and "Officially F**ked Up" by Dead Ent & Paul Wall hits the spot too. Other appearances from Tech N9ne, K-Rino, Charle Boy and Grit Boys help to make this CD the perfect mix. DJ Slice mashes the slower mix too and will be loved by screwheads everywhere. A big release go the Wolftown site and buy it now!